Last winter I visited a very stylish clothing-designer friend of mine at her New York office before grabbing lunch. (She's the type who always looks polished, even when she's at home by herself!) After a few minutes of chatting, she excused herself to get her jacket and returned wearing a cape. A cape! It was then that I realized I too needed to wear a cape. There's something out-and-out sophisticated and elegant about a cape--or maybe it just makes me feel like my superhero stylish friend. 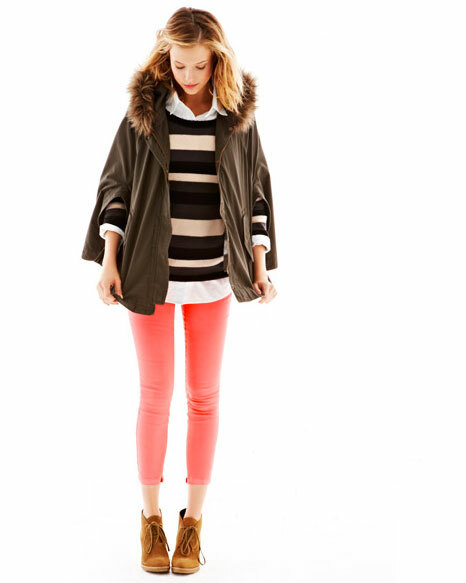 This one by Gap is perfect. I'm in love with a cape! It's fun and whimsical and makes you feel just a little like a superhero. Great Find! Do you think short people can wear capes?! I'm five foot two and worry they are a bit swamping? Am I merely being a cape-chicken? I wouldn't shut up about capes last February when I was on a buying trip with a friend for her boutique. She just got back from another trip and picked up a tweed cape for me as a surprise. I'm so excited about wearing it this fall on a couple weekend jaunts to the states. This post just increased my excitement! How about a messenger bag with a cape? Or a handle bag? I'd wear either with a cape. And yes, I totally think a petite woman can work a care. You may need to tailor, so it hits you just below the hip.